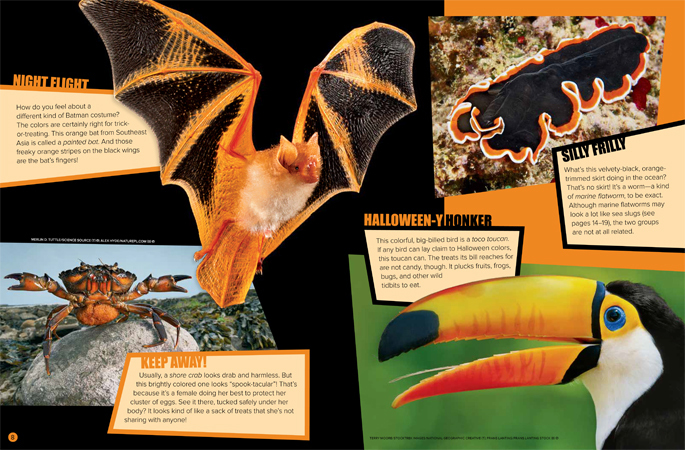 These wild colors are perfect for Halloween decorations. But they’re also natural, everyday colors for many animals. Take a look! SCARY MASK? Whose spooky eyes are those in the photo above? Would you believe they belong to a butterfly? They’re not real eyes, of course. They’re fake eyespots on the hindwings of a black swallowtail (circle). An insect-eating bird might mistake them for real eyes and attack the wrong end of the butterfly. That may give the insect a chance to flit out of the way. Losing a little bit of tail wing is not nearly as bad as getting a direct hit. treating. This orange bat from Southeast Asia is called a painted bat. And those freaky orange stripes on the black wings are the bat’s fingers! Usually, a shore crab looks drab and harmless. But this brightly colored one looks “spook-tacular”! That’s because it’s a female doing her best to protect her cluster of eggs. See it there, tucked safely under her body? It looks kind of like a sack of treats that she’s not sharing with anyone! What’s this velvety-black, orange-trimmed skirt doing in the ocean? That’s no skirt! It’s a worm—a kind of marine flatworm, to be exact. Although marine flatworms may look a lot like sea slugs, the two groups are not at all related. This colorful, big-billed bird is a toco toucan. If any bird can lay claim to Halloween colors, this toucan can. The treats its bill reaches for are not candy, though. It plucks fruits, frogs, bugs, and other wild tidbits to eat. ​​​​​​​​​​​​​​​​​These two young tigers are actually play-fighting. Here, they look like mirror images of each other. But when they stride off into those tall grasses, they’ll seem to disappear altogether. 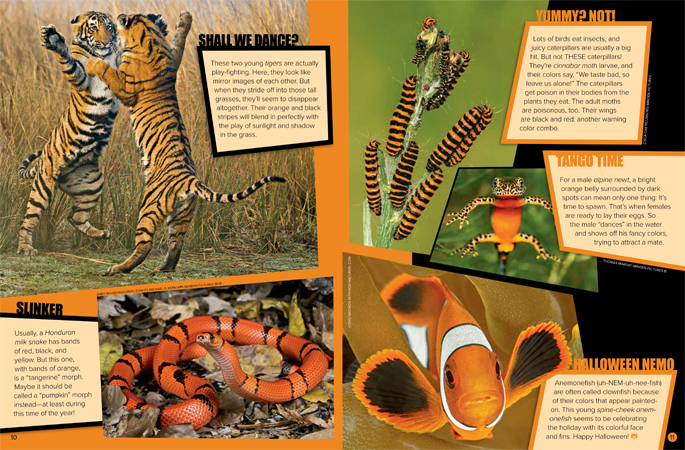 Their orange and black stripes will blend in perfectly with the play of sunlight and shadow in the grass. Usually, a Honduran milk snake has bands of red, black, and yellow. But this one, with bands of orange, is a “tangerine” morph. Maybe it should be called a “pumpkin” morph instead—at least during this time of the year! Lots of birds eat insects, and juicy caterpillars are usually a big hit. But not THESE caterpillars! They’re cinnabar moth larvae, and their colors say, “We taste bad, so leave us alone!” The caterpillars get poison in their bodies from the plants they eat. The adult moths are poisonous, too. Their wings are black and red: another warning color combo. For a male alpine newt, a bright orange belly surrounded by dark spots can mean only one thing: It’s time to spawn. That’s when females are ready to lay their eggs. So the male “dances” in the water and shows off his fancy colors, trying to attract a mate. Anemonefish (uh-NEM-uh-nee-fish) are often called clownfish because of their colors that appear painted on. This young spine-cheek anemonefish seems to be celebrating the holiday with its colorful face and fins. Happy Halloween! 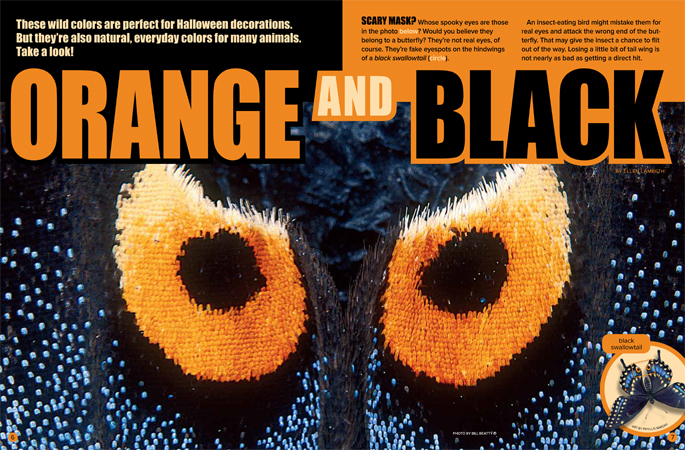 “Orange and Black” originally appeared in the October 2017 issue of Ranger Rick magazine.